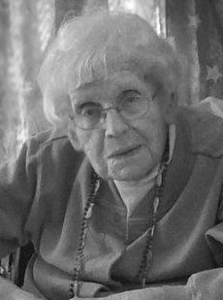 Pauline (Choma) Demetro, 93, of New Britain, widow of Walter Demetro, passed away quietly Tuesday, Jan. 22, 2019, at Jerome Home. A native and lifelong New Britain resident, she was the daughter of the late Michael and Anastasia Choma. A graduate of New Britain High School, Class of 1942, she was employed at the former American Hardware and Emhart Corporation for 43 years, retiring in 1987. Pauline was a member of St. Mary’s Ukrainian Orthodox Church in New Britain; sang in the church choir; was a former member of the church council and a member of the St. Olga’s Sisterhood. Besides her husband Walter, she was predeceased by a stepson, Walter M. Demetro; four brothers, Peter, John, Michael, William, and a sister, Anna Choma. Pauline is survived by stepdaughters-in-law, Rosemary Demetro and Cynthia Demetro, stepson, Michael Demetro; four grandchildren, Kelly (Jason), Melissa, Christopher, and Alex, and a great-granddaughter. She is also survived by several nieces and nephews, Barbara Robinson, Virginia Nelson (Michael) William Choma, Peter Choma (Karen), Richard Choma (Kathy); and numerous grand and great-grandnieces and nephews who loved her dearly. Funeral services are Monday, Jan. 28, 2019, 10 a.m. at St. Mary’s Ukrainian Orthodox Church, 54 Winter St., New Britain, CT 06051. Burial will follow in the church cemetery. Calling hours are Monday morning, 9 to 10 a.m. at the church. Memorial donations may be made to St. Mary’s Ukrainian Orthodox Church. Carlson Funeral Home, New Britain, is assisting with arrangements. Please share a memory or note of sympathy at www.carlsonfuneralhome.com . Posted in New Britain Herald, on Wednesday, 23 January 2019 18:12. Updated: Wednesday, 23 January 2019 18:14.